Since 2015, the Royal Society Publishing Photography Competition has celebrated the power of photography to capture science in its many forms, and the role these great images play in making science accessible to a wide audience. The competition was open to scientists, and winning entries will be chosen according to 2 key criteria: they should be aesthetically pleasing, and convey an interesting scientific phenomenon. As well as an overall winner, a category winner and runner up will be selected for each category. 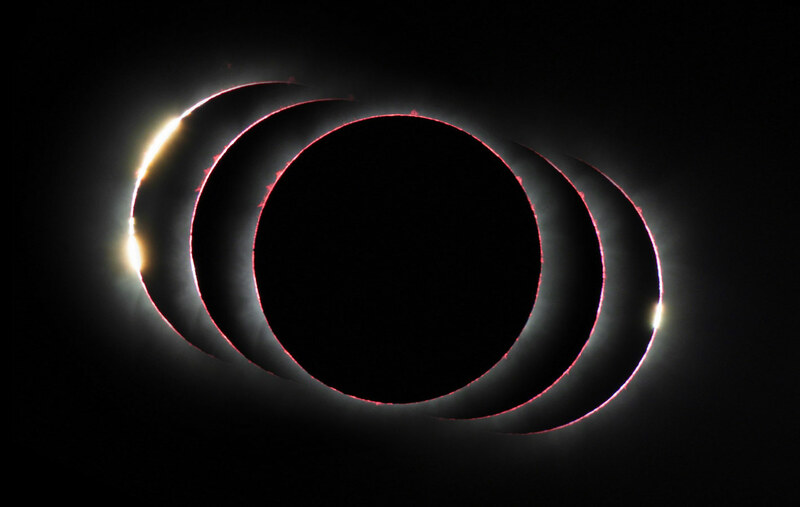 A story about total solar eclipse on November 3rd, 2013. When the eclipse started (on left side of the image), there was a two part diamond ring, which was unusual. It is caused by the angle diameter of the Moon in this case of hybrid eclipse. The magnitude of coverage from Pakwero, Uganda, was just 1,00259, which means the Sun’s photosphere could easily shine above two different locations of lunar limb at the same time. The next hybrid solar eclipse will occur in April 2023 over western Australia and Indonesia. Canon 6D, Rubinar 1000/10, ISO 250, 5×1/500 s, Vixen GPD-2 mount. 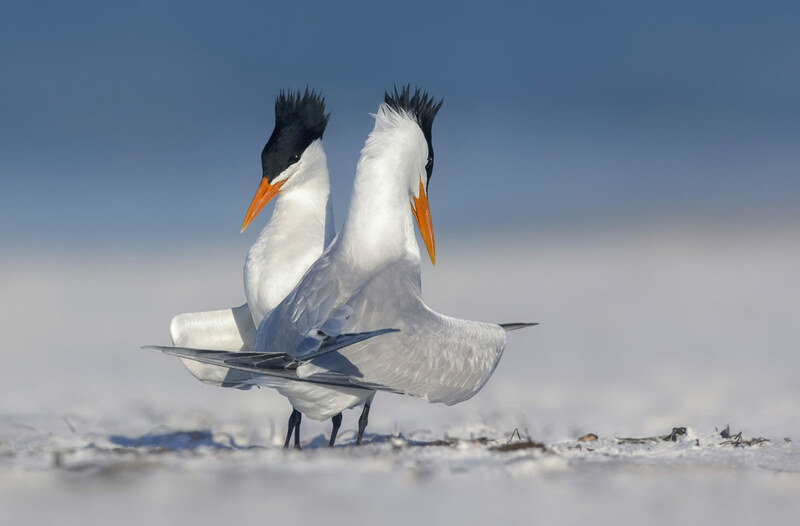 Another beautiful morning on a beautiful beach on the Gulf Coast of Florida seemed to prompt these two Royal Terns to commence an intricate courtship dance. Just out of shot are another 20 or so terns sitting idly by and watching the loved-up pair in action. Photo taken with a Canon 300mm lens and 2x extender. Clean-up (mostly of some background clutter in waves), cropping, setting of white balance, selective noise reduction in the shadows, small dodging/burning and tonal corrections. 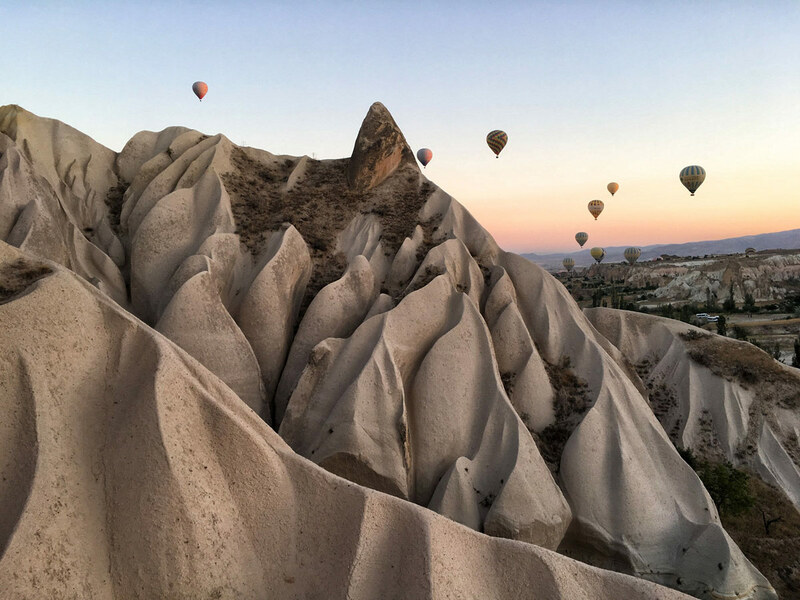 This photograph highlights the volcanic landscape of Cappadocia, Turkey. It was created by a volcanic eruption (fire), is made of volcanic ash (earth), and has been sculpted by wind (air) and water. The view is from a balloon. Photo was taken on an iPhone 6s camera; tonal highlights were enhanced using Color Efex Pro 4 from the open access Nik Collection. 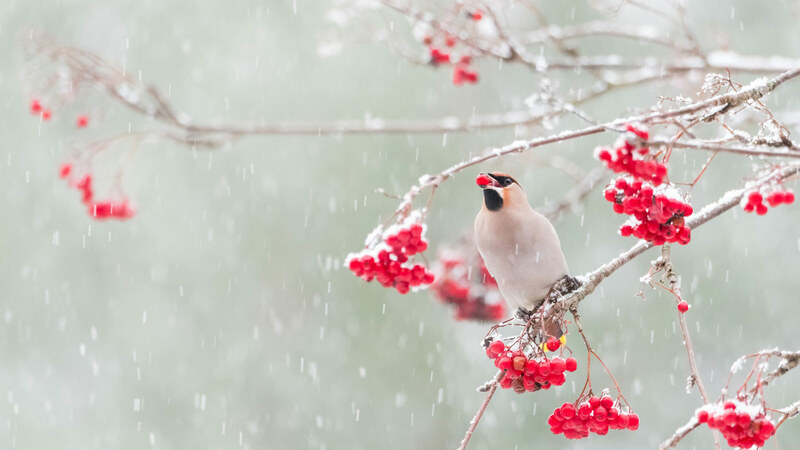 Bohemian waxwings (Bombycilla garrulus) lust after Rowan berries (Sorbus aucuparia) in winter. They fly around in big flocks looking for the most delicious berries but they are picky eaters and do not just go for any berry. They skip certain trees and postpone eating the berries in others for later. Eventually, however, they did come to the trees right outside my office in Finland. Technical specs: Nikon d500 with Nikon AF-S 80-400mm f/4.5-5.6G VR ED; 1/160s, f/5.6 and ISO2800 at 400mm. Edits: Cropped, sharpened, burned and dodged certain parts, contrast and saturation raised, and noise reduced. Within the Institute of Infection, Immunity and Inflammation, scientists and clinical investigators develop different lines of research, from characterising the immune system to understanding the cell biology of parasites, viruses and bacteria and their relationship with their hosts; aiming to develop new therapies and treatments. One research group (Maizels Laboratory) studies the exploitation of the host’s own immune system by helminth parasites and how that could lead to minimising the risk of autoimmunity. The group makes use of a model rodent parasite – Heligmosomoides polygyrus. The adult parasite inhabits the intestinal space of its host and coils closely around the intestinal villi. 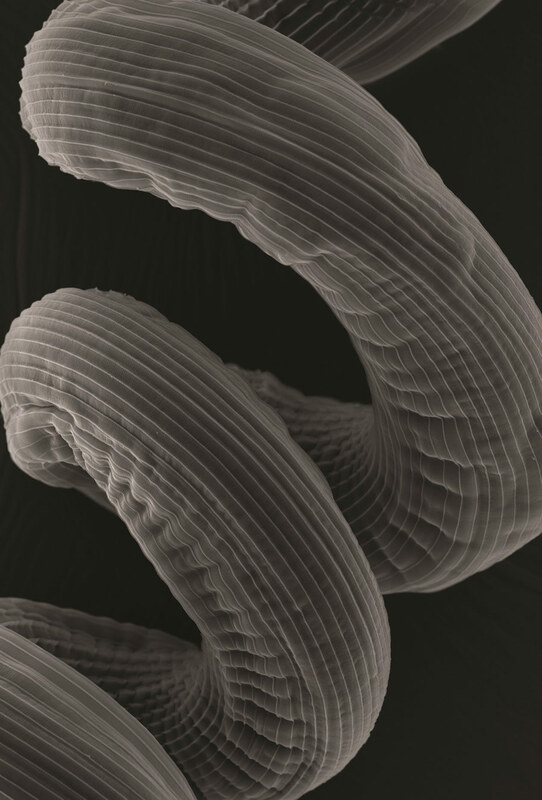 Here we show the striated external surface of this helminth – the cuticle – observed by scanning electron microscopy. Shadow the mount Teide in Tenerife, Canary Islands, at sunset towering over Slooh Teide observatory. The sea of clouds shrouded the landscape at lower altitude, hiding neighbouring islands and the bustling activity of the coast of Tenerife. The colours in the sky are due to the reflection of the different wavelength of the white light as the sun sinks below the horizon. 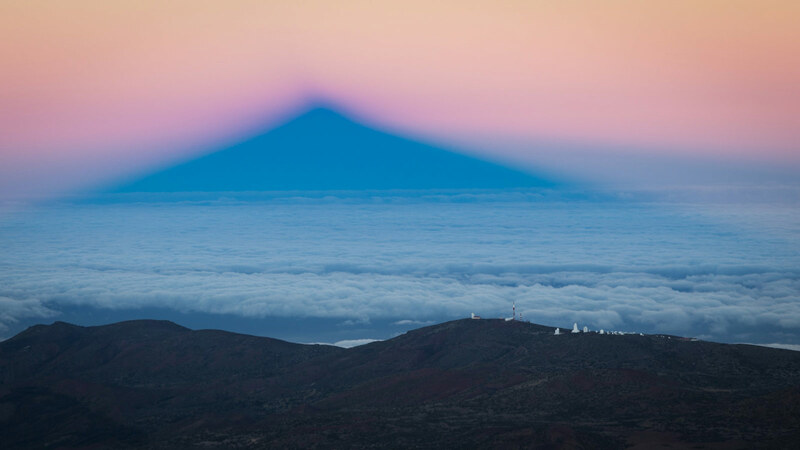 Also when a remarkable topographic feature, such as Mount Teide, blocks the fleeting rays of the sunset, this casts a shadow into the tinted atmosphere. The photograph was taken using a Canon 6D and a Canon 24-105mm f/4 at 105mm f/10 1/13 sec 125ISO. Contrast, brightness, saturation and crop were adjusted. No further processing was carried out. 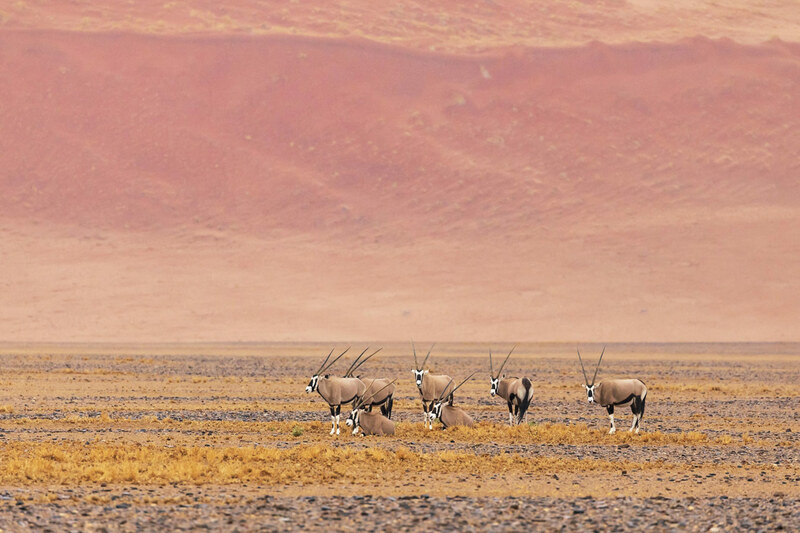 When I observed these oryx resting in an arid place of Namibia, my mind immediately saw a group of antelopes on the surface of Mars. The landscape was arid and red and it evoked a distant planet where we were invaders. They were powerful animals that showed a peaceful moment in a hard place. The ability of this species to resist hard environmental conditions is really surprising and deserved my attention, so I decided to immortalise the moment in my brain. My photography remembers. Namibia; Canon 5Dmark IV. Lense 100-400mm. Slight adjustment of contrast, sharpening and noise reduction. 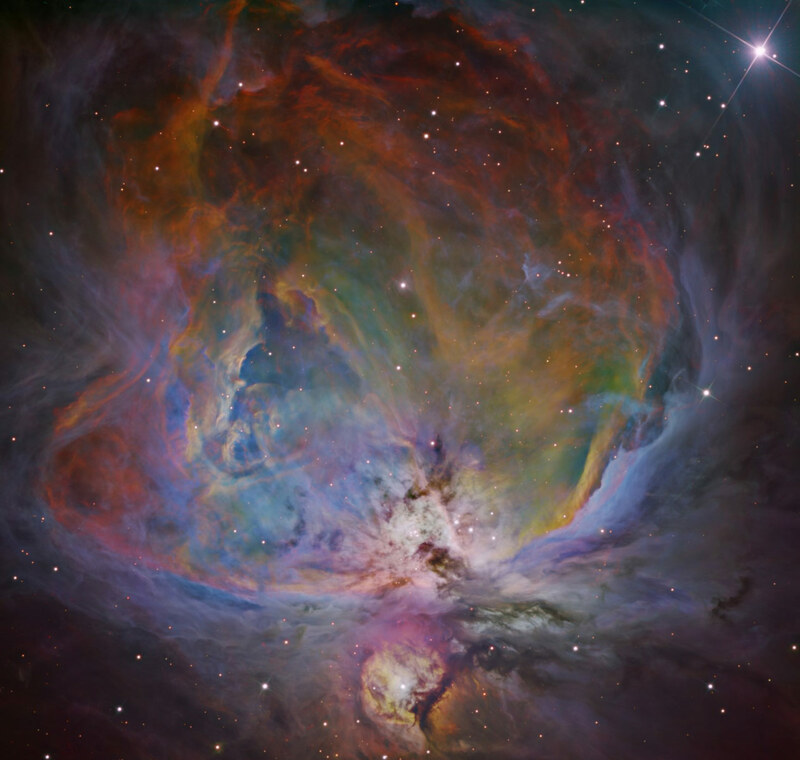 This is an image of the Orion Nebula processed with a 6-filter color mapping process. This process combines data from six different filters (Red, Green, Blue, Ha, SII, and OIII). The resulting image contains detail and color not usually seen with normal RGB processing. This image is a combination of over 39 hours of exposure taken with a CDK-17 telescope and FLI Pl16803 camera over a span of six weeks in November and December of 2017. Parental care is a behavior typically associated with birds and mammals, it is comparatively rare in other taxa such as amphibians. However some amphibians are very devoted parents, the poison frogs (Dendrobatidae) are a great example. 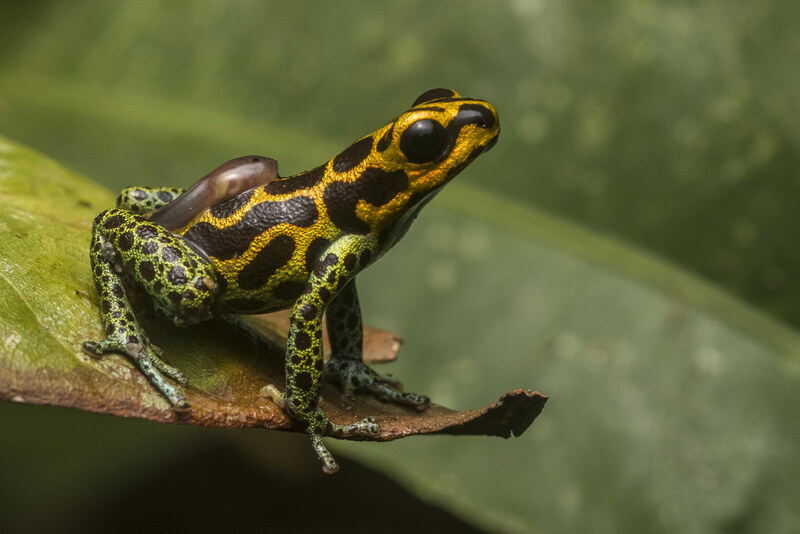 This species is the mimic poison frog (Ranitomeya imitator), which exhibits obligate biparental care. Here, the male transports the tadpole on his back, he will soon deposit it in a small pool of water. Afterwards, he will check back and when the tadpole signals hunger, the male fetch the female who will lay an unfertilized egg for the tadpole to eat in a behavior called trophic egg feeding. This will continue until the tadpole metamorphoses into a froglet. This high level of parental care means that the parent frogs must both be wholly invested in raising their offspring, which may be why this is currently the only species of frog known to be genetically monogamous. Nikon D810 with a 105 mm Nikkor lens and an additional SB 800 flash unit. Image was slightly cropped for composition and had slight color and levels adjustments. Wings experience substantial accidental collisions during the life span of a flying insects. Such collisions often result in irreversible wing damage and, therefore, could significantly influence insect flight ability. In order to investigate the material composition of wings of the dragonfly Acisoma panorpoides, I used confocal laser scanning microscopy (CLSM). During the scan, I observed no autofluorescence from wing membrane. 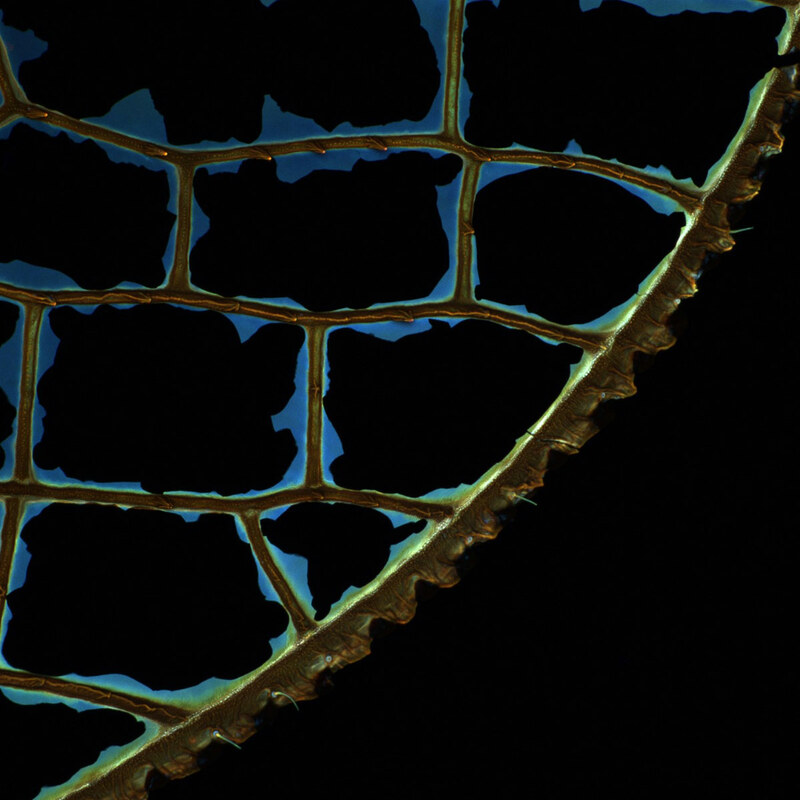 This was very odd, because membranes are known for their blue autofluorescence when subject to laser light. Interestingly, after the scan I found out that wing membranes were all broken.